Co-Optimus - News - Guitar Hero Going Plug and Play? 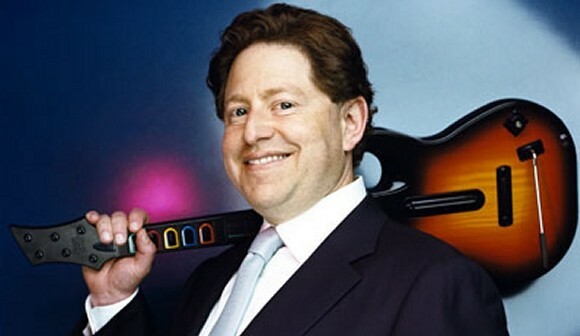 Just when we thought the Guitar Hero franchise might actually be headed in the right direction, Bobby Kotick has to go and ruin it. The oft-despised, Machiavellian Activision CEO offered some hints as to his plans to, in essence, ruin Guitar Hero specifically, and video games in general, eventually. I think what the untethered Guitar Hero does is equal the playing field a little more and give you some leverage with first parties when it comes to downloadable content and the business model. After all, why shouldn't Activision take the entire pie, and not just a piece? He revealed further plans to make other games independent of a console. Could Activision be offering plug and play versions of Guitar Hero and other top franchises before long? Only time will tell. I think we definitely have been able to instill the culture, the skepticism and pessimism and fear that you should have in an economy like we are in today. And so, while generally people talk about the recession, we are pretty good at keeping people focused on the deep depression. Page created in 0.2626 seconds.